This is a 3D animated version of the 3d printable model I uploaded. 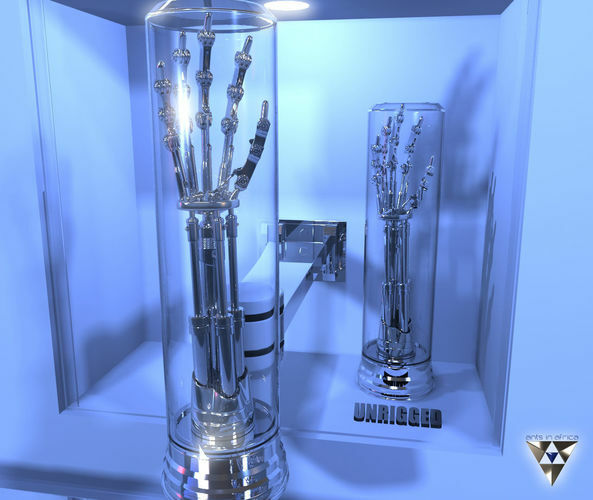 It is based on the Terminator 1 arm from the final scene of the first movie but inserted into the lab scene from the second movie. In this short 400 frame animated scene, the arm (in it's glass case) is moved back into the cabinet by the (pointless) robotic arm (in the 2nd movie) and is electrified back to life... I used splines and glow effects for the electricity. The download includes the ready-to-render 3ds Max 2013 scene with the rigged and unrigged arm as well as the arm in obj format. I am offering this at a lower price because I had already created the model for 3D printing. If you are looking to 3D print the arm and have limited 3d knowledge or would like to save time, then I suggest downloading the 3D print ready version with the PDF guide on this site. I included a re-worked version of the scene that renders fasterand added extra animation of the hand breaking the glass tube.